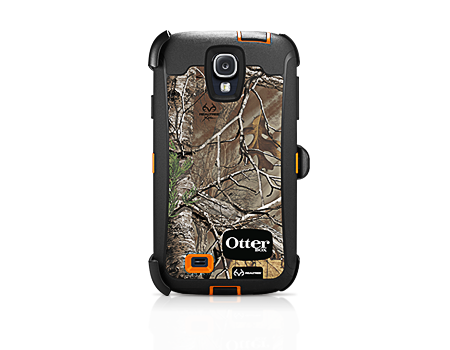 Get robust triple protection against shocks and drops with the OtterBox Defender Series Realtree Xtra Blaze Camo Case and Holster for Samsung Galaxy S4. Protect your next great Android from the rough road of life. The Defender Series is a multi-layer protective case that provides rugged protection. Designed precisely for the Samsung Galaxy S 4, this case provides reliable protection from drops, bumps, and shock. Port covers block the accumulation of dust and lint in ports and jacks. The screen protector is built into the case to prevent scratches and scrapes to the glass display. An included belt-clip holster accommodates convenient carrying and acts as a kickstand for media viewing.